Every year on May 24th, we honor the memory of our founder, David Lawrence Feigenbaum, who passed away from ALS (Lou Gehrig’s Disease) on this date in 2002. Without his vision and hard work, DLRC would have never come into being. In addition this week, our hearts are heavy at DLRC as we mourn the passing of one of our team members, Charlie Browne. Charlie passed away Saturday morning. He joined DLRC in January after a career in numismatics, spanning stints at several major wholesale firms, and three separate occasions of working for PCGS as a grader. Known as one of the top graders for many years, Charlie was also an astute numismatist whose expertise ranged from various world coins to tokens, to U.S. coins. Most importantly, Charlie was always considered a good guy. As many comments have come to us this week, Charlie was a rare gentleman in a world where that is a true scarcity. Charlie was also known to be a fantastic teacher as he had taught the Advanced Grading and Problem Coins class at the ANA Summer Seminar for over a decade. Well-regarded inside the classroom as an excellent educator and on the bourse floor, Charlie was a rare breed of which nothing negative could be said and you never heard a complaint. Charlie will certainly be missed, both in the DLRC Office and on the bourse floor. We are thankful for the time that we had together, and our thoughts and prayers will continue to be with his family. Why we love it: Only four different issues of Seated Dollars were produced at the Carson City mint, and the 1870-CC is the most common. Though, when 12,462 is considered the highest mintage of an issue, it screams value to us. With most examples being heavily worn, an AU example is quite scarce. The surfaces of the coin feature limited wear and perfect detail along with deeply toned fields especially on the reverse. These characteristics along with its subtle signs of remaining luster make for quite intriguing eye appeal. Only six are graded finer by NGC. Value: The PCGS Price Guide has this coin valued at $11,500. This is the only example by either service in this grade and the spread from AU55 at $11,000 seems quite low. Thus, we like the long term value of this piece and have it reserved in this week’s auction for just $9,500. A great value for this scarce CC-Mint issue Seated Dollar! Why we love it: Part of this week’s Prospector Pioneer Gold Collection coins, these territorial gold issues were minted by the United States Assay office before the U.S. mint in San Francisco opened its doors in 1854. As most of these large pieces were melted once the mint opened to form smaller gold coins, only about 200 of these survived. This coin displays nice, intact corners and is an attractive example of this desirable territorial gold issue. A particularly nice reverse with few marks or dents, this is a popular piece from the early part of the California Gold Rush. Value: The PCGS Price Guide sits at $39,500. It is available in this week’s auction with the reserve set at just $38,500. This is a great opportunity to obtain one of the 200 rare U.S. Assay Office California Territorial Gold pieces! 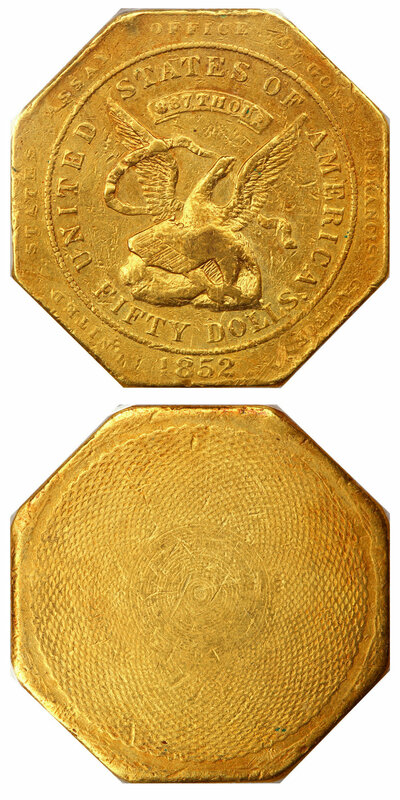 Why we love it: Popular and desirable among collectors, these octagonal slugs are a unique offering from the California Gold Rush Era. The beautiful design was struck before the U.S. Mint started conducting business in San Francisco at the Assay Office under the direction of Augustus Humbert and were widely circulated in California, even once official coins were produced. This example displays expected wear for the issue, yet all devices remain clear and visible. Value: The PCGS Price Guide has this coin valued at $40,000 but is available in this week’s auction with the reserve set at $38,000. This rare and incredibly popular $50 slug is a fascinating piece of history from the California Gold Rush and will surely find a new home quickly once the auction closes Sunday. Why we love it: A slightly better date type coin within the Indian Cent series. This rich, bright red example features incredible coloring and blazing luster that along with its immaculate gem surfaces make for perfect eye appeal. 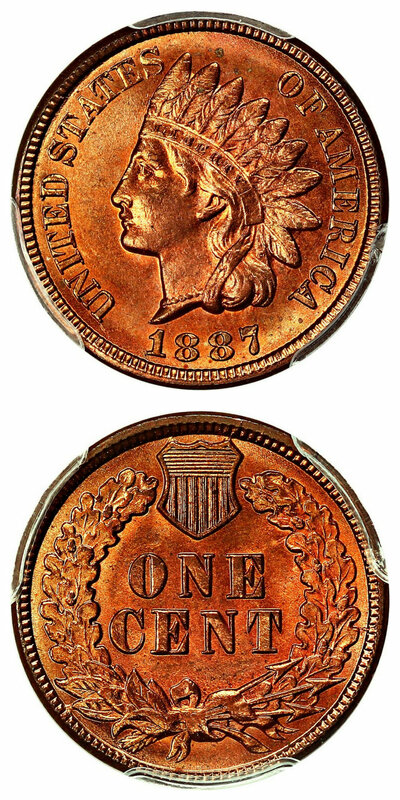 This Indian Cent issue has only two other examples in existence graded finer by PCGS with the Red color designation. Value: The PCGS Price Guide reflects a value of $8,500 and is available for purchase at the low price of just $5,150 via Make Offer. That is an entire $3,350 below the PCGS Price Guide value for this blazing red gem example of this scarcer type coin from the Indian Cent Series! Why we love it: A gorgeous ultra-gem example of this later date issue Buffalo Nickel. This coin possesses perfect eye appeal as its incredibly strong luster, subtle toning and lack of marks make it truly captivating. The coin is mostly white with light tints of rose-gold. This stunning Buffalo Nickel issue is tied for the finest known in existence graded by any grading service. Value: The PCGS Price Guide has this coin valued at $6,000, with the most recent auction record for another example sitting at $5,280 in February! This piece is available at a much better value of just $4,600 via Make Offer as part of our CWL special! This is a rare opportunity to obtain this lustrous ultra-gem example that is tied for finest known! 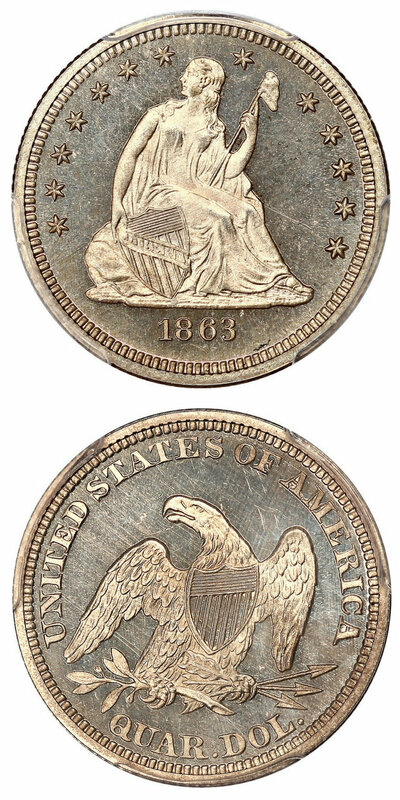 Why we love it: A flashy cameo gem proof Liberty Seated Quarter struck during the time of the Civil War. This mostly white gem example displays pristine surfaces and subtle hues of toning throughout the coin. 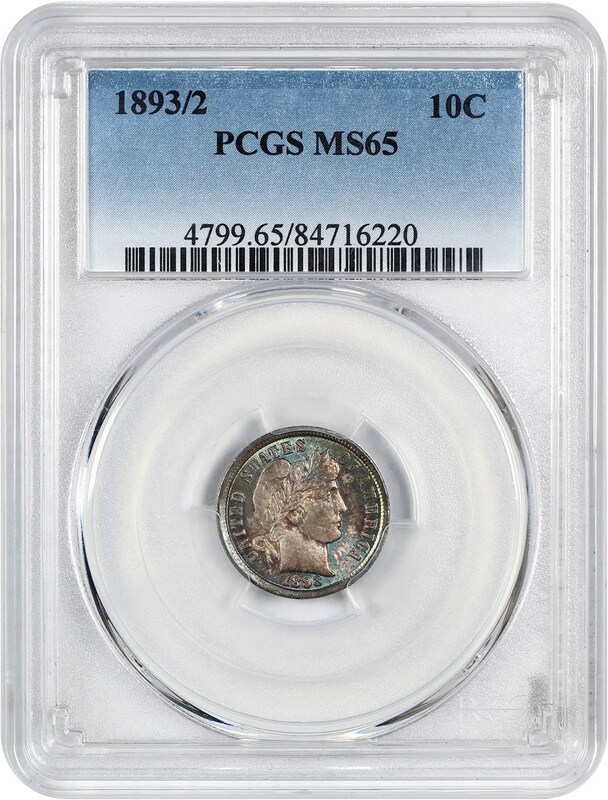 This scarce Proof Seated Quarter issue comes from an incredibly low, original mintage of just 460 coins struck in which only two are graded finer by PCGS with the Cameo designation. Value: The PCGS Price Guide sits at $4,500 with the CPG of a non-Cameo example of $3,800; however, it is available for purchase at the much lower price of just $3,650 through our Make Offer function. That is an entire $850 below the PCGS Price Guide value for this flashy gem example of this cameo proof Liberty Seated Quarter type coin! Why we love it: A beautifully toned gem Trade Dollar type coin from the San Francisco Mint. Both sides of the coin are covered in blazing luster and lovely rose-gold toning. That along with nearly perfect surfaces give this coin premium eye appeal. A popular collectible issue amongst collectors, these are seldom seen in gem condition. Value: The CPG lists this coin and grade at a value of $8,800 with the PCGS Price Guide value of $8,500. Offered this week for a far more reasonable $7,000 via Make Offer as part of our CWL special, this gorgeous gem example with rose-gold toning is not going to be available much longer! 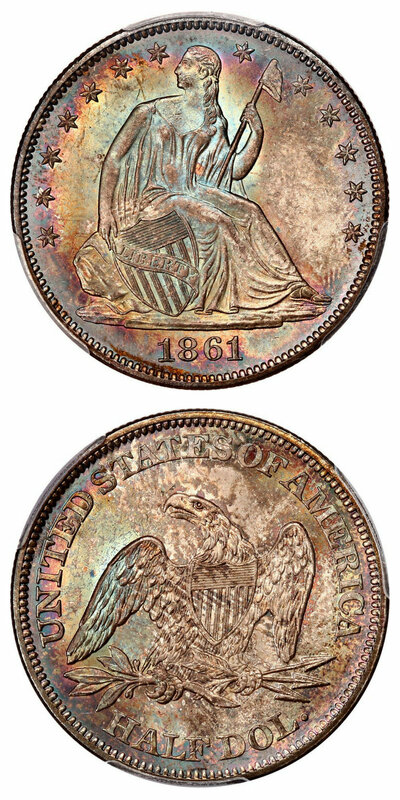 Why we love it: A popular and scarce, beautifully toned gem from the Civil War Era, this incredible rainbow coloring covers the entire coin including stunning light blue, gold and magenta highlights. This gem also features strong luster and blemish-free surfaces which has earned it a well-deserved CAC approval. This Civil War Date Seated Half Dollar is bested by only four other pieces graded by PCGS. 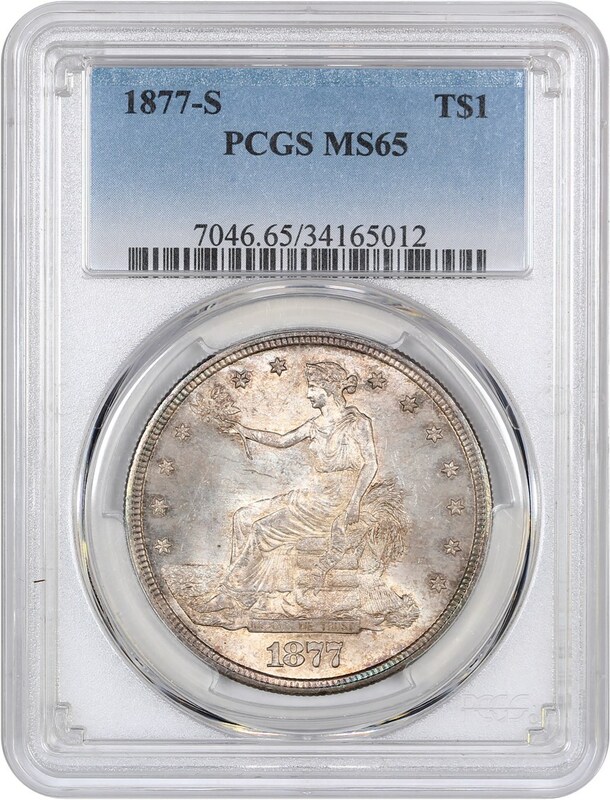 Value: With the PCGS Price Guide sitting at $12,000, but the most recent auction records sitting at over $13,500, we see this lovely example as an excellent value, reserved at $12,250 in this week’s auction! A great opportunity for the advanced collector to obtain a scarce date in a rare grade! Why we love it: A gorgeously toned gem example of this desirable overdate within the Barber Dime series. Both the obverse and reverse feature stunning blue and green highlights with a lovely, light rose center. This captivating color along with its underlying luster and pristine surfaces make for beautiful eye appeal. This overdate Barber Dime issue has only six other examples in existence graded finer by PCGS. Value: The PCGS Price Guide has this coin valued at $5,200 with the CPG at $5,400. Available in this week’s auction with the reserve set at the reasonable amount of just $5,000. 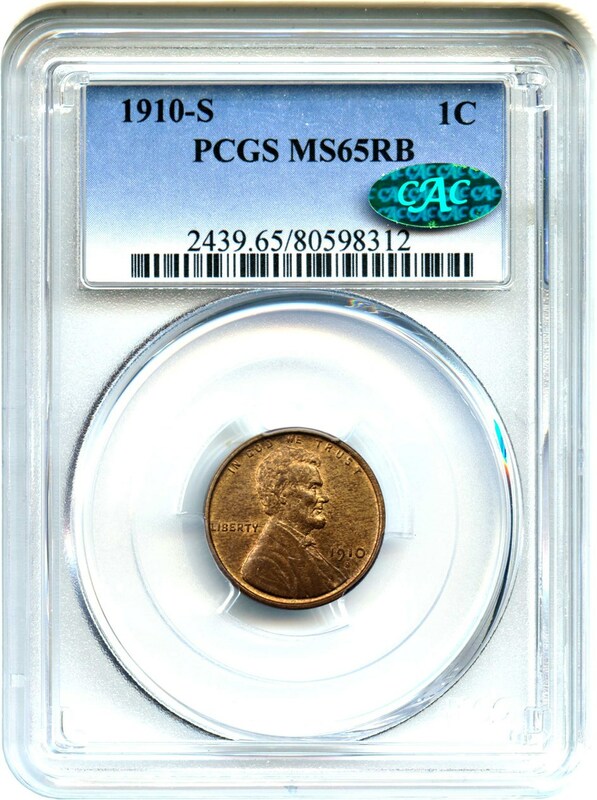 Why we love it: A scarcer, early S-Mint Issue Lincoln Cent in lovely gem condition with pretty brown tones and underlying bright red highlights. The lack of blemishes and extraordinary luster make this gem seem arguably under-graded. Value: This slightly better date Lincoln cent is valued by PCGS at $425 and is for sale via Make Offer for just $450 this week. With the most recent auction records just under $500 for a CAC-approved piece, this is an excellent value in our eyes. 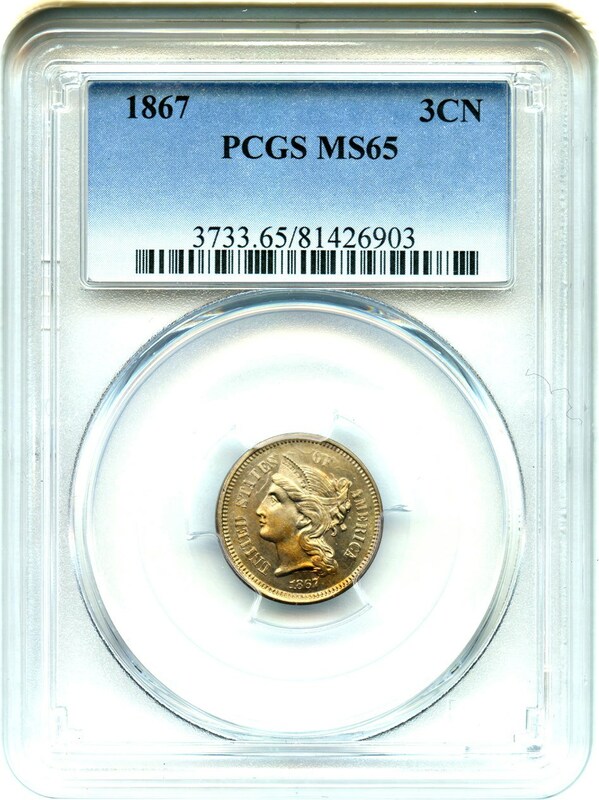 Why we love it: A lovely gem Three-Cent Nickel type coin with stunning golden toning covering the entire coin that features streaks of vibrant orange-gold highlights. This beautifully toned gem displays pretty underlying luster and limited amounts of blemishes that make for premium eye appeal. Value: The PCGS Price Guide has this coin valued at $600. It is available for purchase at the fair and reasonable price of just $500 via Make Offer. 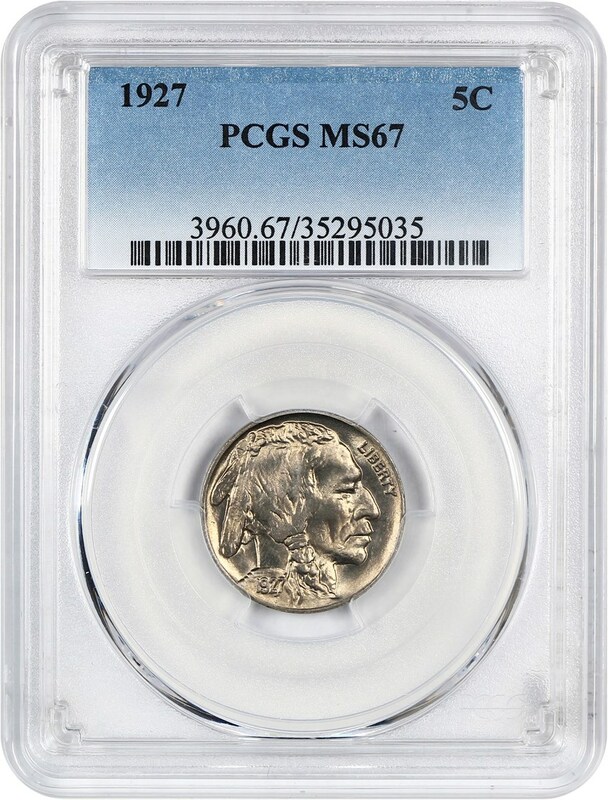 That is a solid $100 discount off the PCGS Price Guide value for this gem example of this popular 3-Cent Nickel type coin! Why we love it: An affordable and intriguing lot of five nearly perfect gem Buffalo Nickel type coins. All the coins display ideal luster, blemish-free surfaces and well-struck devices that feature sharp, clear detail giving them premium eye appeal. This is a fantastic opportunity to acquire these gorgeous Buffalo Nickels for a reasonable price. Value: The PCGS Price Guide has this lot of five coins valued at a combined $375. The group is available for purchase at the low price of just $275 via Make Offer as part of our CWL special. 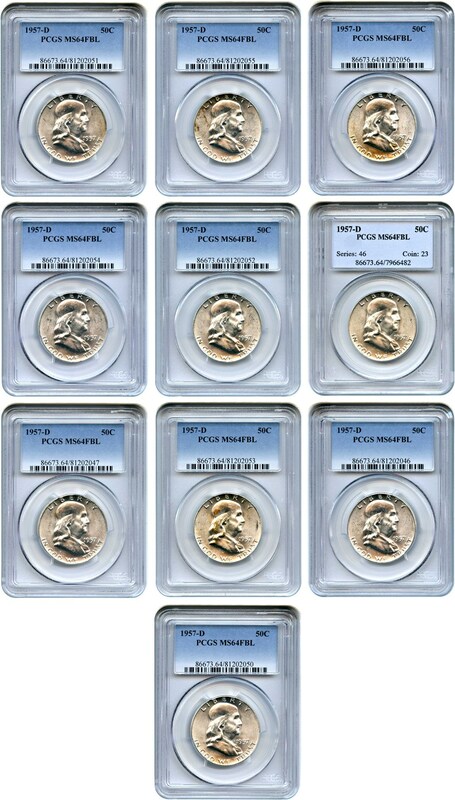 That is a solid $100 discount off the PCGS Price Guide value for this fantastic set of five gem Buffalo Nickels! Why we love it: An affordable, sizeable lot of ten near-gem Franklin Half Dollar type coins. All ten coins feature clear full bell lines and well-struck devices with sharp detail giving them high-quality eye appeal. Value: The PCGS Price Guide has this lot of ten coins valued at a combined $470. The group is available for purchase at the fair, lower price of just $300 via Make Offer. That is a solid $170 discount off the PCGS Price Guide value for this set of ten near-gem Franklin Half Dollar type coins! Auction #1015 Lots Posted. Browse & Bid Now!